As we enter the closing stretch of the campaign, substantial uncertainty remains about the final outcome. 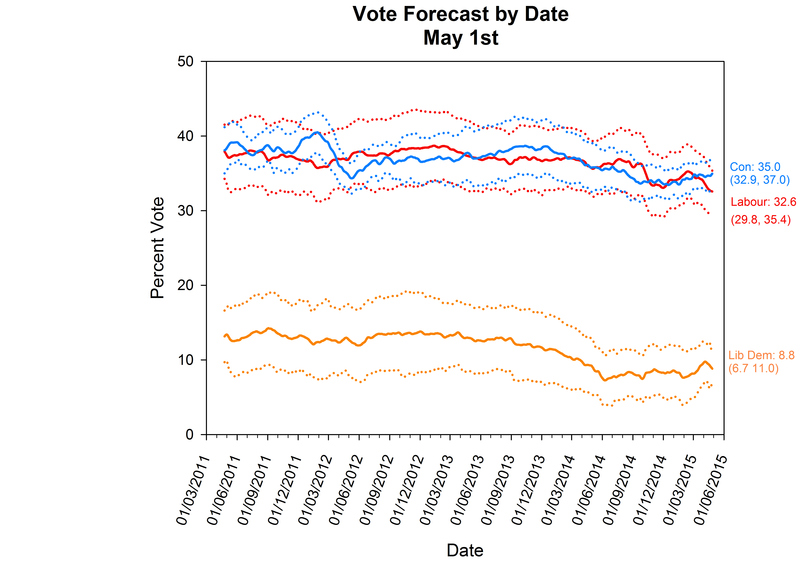 Taking out the random noise, the polls are still showing a close race ahead of May 7th. Some have pointed to differences between telephone and internet pollsters, with the former having shown a steady, if slight, Conservative lead all year. Our method allows us to control for systematic differences between polling houses and variation in the ‘poll of polls’ that is due to changes in the mix of pollsters in the field at a given point in time. The latest Polling Observatory forecast covers all polls completed up until April 30th, and shows support for the two main parties is still in the balance – with Labour on 33.1% and the Conservatives on 34.2% — though the confidence intervals are such that we cannot say for certain that the Conservative lead is greater than zero. Our vote forecast points to a higher level of support for the Conservatives than two weeks ago, up 1.4 points at 35.0%, with Labour on 32.6%, up 0.1 points. This reflects the squeeze that the “big two” have put on other parties in the final weeks of the campaign. The Conservative lead now stands at 2.4%, but with considerable uncertainty remaining in our forecast. This slight shift in the balance of polling is reflected in our latest seat estimates. The Conservatives’ median estimate rises by six seats, Labour falls by six seats, and the Liberal Democrats fall by four. This puts the median Conservative seat lead at just two. However, as the confidence intervals attached to our estimates reveal, this projected lead is highly uncertain, a veritable coin-flip, with a 53 per cent chance that the Conservatives will have more seats than Labour. A majority for either is at present very unlikely, e.g., the likelihood of a Conservative majority is tiny (less than 0.2%). Our estimates further reflect the gains made by the SNP in recent polling in Scotland, with the nationalists now forecast to win 54 out of 59 seats north of the border. The Conservatives’ paths to a governing coalition are even more winding than their slight lead in votes and seats. They cannot reach a majority with the backing of the Liberal Democrats (combined 298 seats, 15 short of a majority) or with both the Liberal Democrats and the Northern Irish DUP (combined 306 seats, assuming the DUP once again win 8 seats), or even by adding UKIP to that two party combination (308 seats total). It would be very hard, with this seat outcome, for the Conservatives to sustain a government without some form of acquiescence from the SNP. Things are rather more promising for Labour. While they cannot reach a majority with the help of the Liberal Democrats (combined 300 seats), they can with SNP. Whether that happens remains to be seen, of course. Our projected numbers suggest that while the ballots may all have been counted by May 8th, the shape of the new government may be up in the air for some time after.